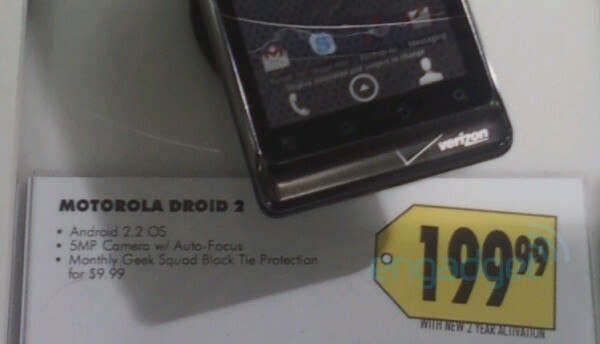 Verizon continues their silence with regard to the actual release date of the Motorola Droid 2, but Best Buy has given us enough insight that we’re expecting Thursday to be the day. After dummy models started arriving last week, plus some employee documents, you can only assume that VZW is simply letting the blogworld create all the press for this one. And after seeing the campaign for the Droid X, how can you blame them? So we’ve got the D2 set to launch at $199 with a new 2 year activation or $599 at full retail. Pretty standard right? Should we also assume that Big Red stores are going with the $299 plus $100 rebate staple? This would be a great opportunity for them to surprise everyone without it.